Popantel is broad-spectrum intestinal worm treatment for felines. It eliminates all species of gastrointestinal worms including roundworms, hookworms and tapeworms in kittens and cats. Enriched with anthelmintic properties, this deworming treatment helps to fight against various worms and protects cats and kittens from their harmful effects. 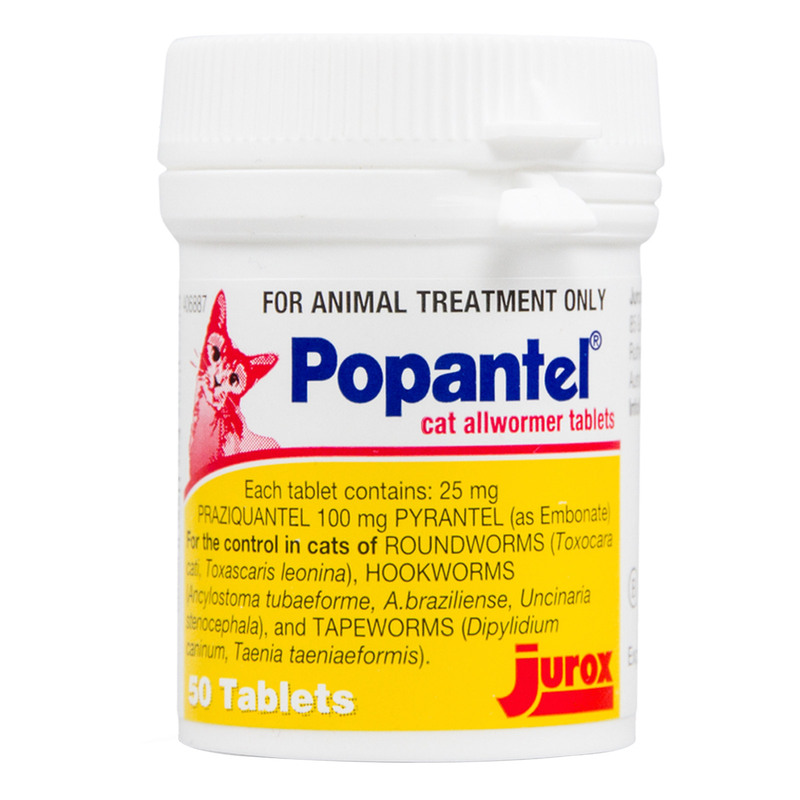 Popantel is effective in deworming all sizes and breeds of cats including old cats, kittens, breeding toms, pregnant and lactating queens and show animals. Popantel is effective for all cats and kittens above 2 weeks of age. It contains Praziquantel and Pyrantel Embonate – two active ingredients that directly attack worms. This anthelminthic formula kills large variety of intestinal worms and help to eliminate them from cat body through natural process. It deworms cats from harmful internal worms such as hookworm, roundworm and tapeworm. Proper dosage on timely basis controls and prevents intestinal worms and further re-infestation. Crush tablet and mix it in your cat food, and ensure the cats finishes the whole dosage. Then monthly from 3 months of age until 6 months of age. Then onwards for adult cats, administer Popantel every 3 months regularly. Popantel is a popular allwormer for wide range of intestinal worms. It treats different worms including hookworms, roundworms and tapeworms. Popantel is suitable to combine with other treatments such as heartworm prevention, flea and tick treatments and vaccination. Potantel has wide margin of safety for all sizes and breeds of cats. This easy to administer tablet is taken by cats with no hassle. This deworming treatment is workable for both outdoor and indoor pets. Treating cats and kittens with Popantel on regular basis prevents worm reinfestation. The side effects of Popantel are rare at the recommended dosage. Quickly removed worm infection in my kitty. I would recommend it to other cat owners as well. Popantel helped prevent worm reinfestation in my two cats. One heck of a product. Love it.